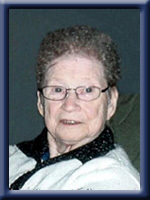 Wentzell, Grace Marie, 81, of Milton, Queens County, passed away peacefully on Monday, October 10th, 2011, in the Queens General Hospital, Liverpool, after a short illness. Born on March 5th, 1930, she was a daughter of the late Whitman and Blanche (Wentzell) Martin. She is survived by her Daughter Gloria (Paul) Whynot, of Milton; their children Gina (Timothy) Stewart, of Middlewood, Monica (Joshua) Taylor, of Beaverlodge, Alberta, Jason Whynot, Justin Whynot, both of Grande Prairie, Alberta; daughter in law Debra Wentzell, of Milton; her children Avis (Jack) Johnson, Peter Smith (Cathy Whalen), both of Milton; six great grandchildren Sarah, Emily, and Spencer Taylor, of Beaverlodge, Alberta, Kale Johnson, Kristen Smith and Emily Swansburg, all of Milton; sisters Lillian Thompson, of Lower Sackville, Rachel MacLeod, of Sandy Cove, Geraldine Labrador, of Liverpool; brothers Clayton, of Bridgewater, Murray (Anne), of Lower Sackville; sister in law Kathleen Wentzell, of Liverpool; as well as many nieces and nephews. She was predeceased by her husband Ray; companion Paul Whynot; son Earl; sister Violet; brothers Rolland and Douglas. Dear Gloria and family, my prayers and thoughts are with you all at this time…I know she will be missed,remember the goods times you shared with her. The most heartfelt condolences from my family. I will always remember her kindness, smile, and how sweet she was. Rest in peace Grace, we will all miss you. We were sorry to hear of your Mother’s passing. Our thoughts and prayers will be with you during these trying times. Gloria and family, we are so sorry to hear of your Mom’s passing. She was a lovely person. To Gloria & Family & The Family of Debra Wentzell , We are so sorry to hear about of Grace . She was a very kind person . & always had a smile on her face . When we use to see her on the street she had always said Hello to you . She will be sadly missed . May you rest in Pease Grace. Gloria & Debra if there is anything that I can do pleace feel free to ask me . Debbie & Maynard Carrier. So sorry to hear of your Mother’s passing. Thinking of you at this time.